My name is TJ Holmes. I live in the southwestern corner of Colorado and have been visiting the wild horses of Spring Creek Basin since October 2002, documenting them since immediately after the roundup in August 2007. Documentation of horses in a particular herd is a vital to protecting them. Local advocates also urge the use of fertility control with native PZP and bait trapping instead of helicopter-driven roundups. The horses are the priority. 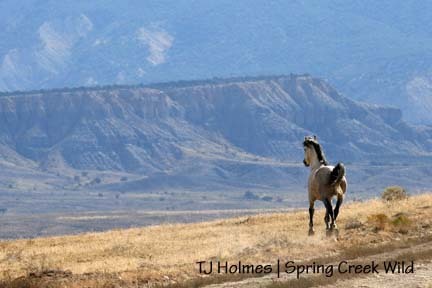 The goal of this blog is to allow people to view the mustangs of Spring Creek Basin as they would if they could be there themselves, with a certain amount of joy and wonder thrown in because that’s what I feel every single time I visit. That’s my girl! I enjoyed reading about the horses, tho I’ve heard most of the stories and seen the pictures. GREAT job! And a great service! the horses that do not get adopted will be brought back to holding and will be tried again. after 3 times, they are sent to either a sanc. or LTH on a private ranch where they will live out their life. The blm doesn’t say this horse is adoptable or not, the PUBLIC does when they do not adopt. I believe “unadoptable” horses go to one of the various sanctuaries the BLM has for wild horses that have not been adopted, whether because of age or other reasons (I read somewhere that there are now more wild horses in holding pens than in the wild). I’m not really sure what leads the BLM to label a horse “unadoptable,” but to me, that’s like calling a child “unteachable.” Every person – and every horse – can learn, and we do them a huge injustice to label them otherwise. The stallion I call Grey (otherwise known as Traveler) that we rescued from Canon City is at least 14. He was in a round-pen “quarantine” for three weeks, during which time I was able to see him up close. Such intelligence in that horse’s eyes! I have no doubt that the right hands could coax him to overcome his fear of people. But horses over 10 are considered unadoptable – stallions, especially so. I’ve been thinking about this lately, too. You hit the nail on the head when you observed how frightened the horses were in that pen. In my experience, the only thing wrong with “bad” horses is the person trying to “train” that horse. My goal isn’t to use this blog to rant against the BLM (there *are* some good folks! ), but I think a generic problem is that it is an agency trying to manage wild horses as they would cattle, when a better course would be to manage wild horses as deer or elk – as wild animals, not livestock. I believe some “unadoptable” Pryor horses were, in fact, adopted and are doing quite well with their owners. Matt knows this better, but I think they were called “unadoptable” because they simply weren’t adopted. I know that you care as much about the wild horses as I do. Have you read the report by the BLM that says that the Pryor Mountain herd should be reduced to 95 to 99 horses? I do not even want to get into the ways they say thi s should be done . They want to limit their water sources and only leave the younger horses on the range. I think you realize that with age comes experience. This applies with horses as well as humans. If you have followed Matt’s blog as I hav ethen you read the comments in the Billings Gazette. I could not believe some of the things posted there. One person actually said “Where are the wolves when we need them” . Another was concerned about the foals blocking traffic by going across the street. There was yet another that had the nerve to say that the horse was not indiginous to this country. Do they not realize that for 1 the horse was here long before humans were and 2 where would this country be without the horse? It was the horse that was the most helpful part of man conquering the west in this country. Just try getting a wagon train across this country without them. Needless to say I am mad enough to spit. I don’t know what it would take to convince these people that that the horse should be respected for all that it has done for this country. Thank you for your comment on my blog. I have no way of responding from my blog. I appreciate your support. You are right, there is not much snow left right now, it is melting fast. Sorry, I didn’t see your post until today. Yes, I did read part of the BLM report for the Pryor horses, and I read the Billings Gazette article – and the comments – and was just as shocked as you. After reading all those replies, I realized that the BLM isn’t the only entity we’re fighting; we’re also fighting negative public perception (where did it come from?). In spite of all the “green” news being bantered about these days, I think maybe most people have been “cityfied” or influenced by popular hunting opinion. I really don’t know. A lot of people see horses as no better than invasive weeds, it seems. I don’t have anything against cattle (my folks raise some cattle), but I have to say I really hated to see them in the herd area a couple of weekends ago … but then again, the horses in our herd area are descended from ranchers’ horses, so I have to respect that tradition, too. People tend to forget, with our 40-inch plasma screens and iPhones (I don’t have either), that we’re really not so far removed from the horse and buggy days! Some people just get it how important horses were to our history and are to our present; other people will never get it. I was surprised, like you, by the wolf comment. I bet that same person is happy about the new wolf hunting season in Montana now that wolves are about to be delisted as an endangered species. Two opposite ends of the spectrum (wild horses and wolves), but both are controversial species. Why? Everyone is entitled to his or her own opinion, I suppose. Lowering the number of horses on the Pryor Mountain range is not the answer, in my opinion – especially because of the unique bloodlines of the horses but also because of their traditional use of the region beyond the fenced boundaries of the specific wild horse range. Man keeps encroaching onto lands that have always been wild. Will we be happy when there are no wild horses or elk or mountains lions or wolves left? The AML (appropriate management level) of our Spring Creek Basin herd is only 35-65. The BLM here introduces horses from other Colorado herd areas periodically to maintain viable genetics, but our horses don’t have the unique trace back to Spanish horses that the Pryor horses do. In the Pryors, it’s critical to keep a viable herd size. Once you (the BLM) meddle with that uniqueness, it’s gone, and there’s no getting it back. I suppose this could have been a blog post; it’s awfully long! But I have been following Matt’s blog religiously about the BLM evaluation there, wondering how it will all play out. Are you guys getting this snow that has us socked in? Very wet and already mostly melted, but it’s supposed to snow through Saturday. I’m leaving Saturday for Tucson and the Wild Horse and Burro Program meeting there Monday. I’ll have an update on the blog when I get back. Like you, I am looking forward to foaling season! I realize that your horses don’t have the Spanish Barb background that the Pryor Mountain horses have, but that does not make them any less valuable as a part of our heretige and theirs. They are still reminders of our past. Your herd reminds of Indian ponies. Being of Native American ancestry I really appreciate the role of the horse in our past. I have also learned the signivicence of a horse of color. I must agree with you on the issue of Appaloosas. I realize that they are loving, they are just not very focused. Shall we say they are a little flighty? I would love to see your horses. When is the best time? I need to make arraingments to see Fools Crow in the Pryors and your horses all in one vacation. After your observations, what do you think is a viable number for your herd? There are plenty of us out there that would fight for our right to keep the wild horse herds running. I have some journals from Telluride for you. At the front desk of Public Lands Office. Great! I had just replied to an email from Mary K telling me you had them. I’ll be at the DPLO for a meeting Wednesday morning. Thanks! Our horses are absolutely a valuable reminder of our history and heritage, and I hope I didn’t imply otherwise. I don’t know the science behind genetic viability, so I don’t know if it’s a different number for our horses vs. say, the Pryor horses, but the accepted number up there is about 150 (Matt has a new Q&A post that is well worth reading). Based on the huge disparity between our AML and that 150 number, getting our herd to a number that would support non-introductory genetic viability is probably moot. Our herd area is just too small and the range too poor to support that many horses. One hope we have is getting rid of the remaining cattle AUMs and thus increase our AML, but I still don’t think it would increase significantly; the cattle are on the range only three months (in fact, they’re off now! Yay!). The best time to visit our herd area is summer or fall, both because of foaling season and because of access. I always love to show off “my” ponies! You are a woman after my own heart. I read back through your bio and was really interested about the horses you have been around. I worked at a riding stable off and on for a long time just to be around horses. After being there for a while, I began to notice that their background wasn’t as important as their own individual personalities and traits. All of the horses on this continent, wild or tame came from common ancestors and should be treated as such. As you would say, allow me my soapbox. There is nobody in particular to blame, unless we all want that honor. I can only hope that you get to see your horses live to be a ripe old age and breed that need to survive into their offspring. I am running out of room like the mustangs so I will sign off. As usual, you have found a noble cause and do an excellent job writing about it and bringing it to the people. It’s easy to see your genuine concern and enthusiasm. You’re doing an excellent job. Speaking for the horses, THANK YOU. Thanks, Uncle Tom! I’ve definitely found my “whales” to save. Heyla to Kayla! I spent most of my formative years in the city where having a horse was out of the question. Fortunately, this did not dampen my hope that some day I would have a horse of my own.When I turned 16 my father asked me what kind of car I wanted, and I cannot say he was totally surprised when I asked for a horse instead. Except for a brief time, horses have always been a big part of my life. I now have three generations of horses at my house and they are all unique in personalities. I do not ask much of them other than they let me interact with them and watch them run. I realize that when they meet me in the evening after I get home from work, they are not so much glad to see me as they know that I am there to feed them, None the less. I love them. They can be real heifers sometimes, but they have taught me so much. Most of all they have taught me that that trust is very important. You can do anything with them if you trust them and they trust you. One thing I learned working at a riding stable is that horses know if you are scared or if you can put your trust in the horse to the point that it can take you around the trail without either of you getting hurt. It is getting to be that time of year when I have to plan my vacation, so please let me know where I can find you and your horses. I can split my vacation between the Pryor Mountain horses and yours. I met some folks at the roundup last August who adopted a pinto colt in 2005 and another in 2007. The husband had no experience with horses, but his wife had grown up with horses, then left them behind for family. One might first think “whoa – mustangs and inexperienced horse people?! Baaad combination!” But listening to them talk about their mustang – particularly the no-experience husband – it became clear that it was just about the best combination possible. He brought the colt into their family with no expectations and let the horse teach him. To find us, get out your Colorado map, look way down in the southwestern corner and locate Cortez. Follow U.S. Highway 491 northwestish to Dove Creek. Just beyond DC, follow Colorado Highway 141north. The road curves and goes almost directly east through Disappointment Valley. If your map is detailed enough to show Disappointment Creek, the herd area is mostly in San Miguel County north and east of the creek; the south tip of the herd area (which also is a wilderness study area) is in Dolores County. You can also check the BLM link on the blog roll; I think there’s a map on that Web site. I have vacations tentatively planned, too, so let me know when you’re thinking of coming. I just finished reading your blog and your comments. I ws especially takenby the one you wrote about “adoptable or not adoptable stallions”. That was a lot of insight into what is truth and non truth about the horses, especially after they are gathered in stressful situations. Thank you for your sharing that. I am so excited to have come upon your website! Great job! I have been following your blog for months now. I am so impressed with your work. I have visited and photographed the wild horses in Colorado (Little bookcliffs), WYO ( Red Desert and Pilot Butte) and also in a few different places in Nevada. I would love to visit your area. I am a fellow horsewoman that has a life calling to advocate for and protect these sentinent creatures. I would love for you to contact me. I tried to email you from your reply but it keeps coming back.. I would love to come out when you get back. Please email me again so we can connect. I would love to meet you out there. Have a great trip to the Pryor Mtns. how was your vacation?? i cant wait to hear from you!! i have updates on Cheyanne..
i was just wondering if you had any information on the horses that were rounded up in 2007. or if you had any other blogs before the roundup. i have gotten the other mustang now from my teacher and i have just fallen for him so fast. he is a wonderful gray and is built so well he has the cutest face and i think he is going to be so much easier to work with than cheyanne. i would love to see them in the wild if you have anyhting on the herds before the round up or if there was a catalog of the horses that were sold for adoption. I have been a student of equine history, and especially the wild horse of the Americas (both South and North) in light of the Spanish Conquistadors arrival and subsequent hemisphere conquest from the horseback. I think your idea of studying the herds and ‘personalizing’ the animals is great and absolutely essential in bringing much desired protection to the mustang herds in the Western US. These animals are walking horse heritage all the way to first animals ridden the Kazakh steppes of Eurasia 6000 years ago – via genetic studies of the Iberian descent horses in the Americas . And they do carry the best gene pool possible for the future horse breeding, as they follow only one way of survival – of the fittest. I also think this is the best idea to protect the herds from the government itself, and I hope your approach will spread and it will help to eventually curtail the omnipotent BLM and their herd missmanagement, including the so called BLM biologist on the payroll of us, the taxpayers. So having said that I applaud your idea and perhaps next year will visit you, provided that the BLM will decide to allow some horses on the ranges, as coming next spring we are moving your state :). I think they should stop using this name – Spanish mustang and use Iberian mustang instead as most of the conquistador horses came from today’s southwestern Spain and southern Portugal, i.e. Iberian Peninsula. Although the horses came from Iberian Peninsula the Spaniards had about 40 years to develop a type of horse we know now as Spanish mustang as the true conquistador horse was born in the new ranches – encomiendas – in Cuba, Hispaniola etc – Caribbean Islands – between 1492 and 1530s. Also during this crucial period and after the initial importation of the 1490s the Spanish Crown imposed bans on importation and shipment of horses from the mother country to the colonies, and Andalusians were yet to be developed in Cordoba ( 1580s AD). From these islands war horses and broodmares were taken to the continent where they spread and multiplied beyond belief 🙂 .., eventually giving us American Quarter horse along the way. Hey- I was a school teacher in Paradox, Colorado last year (Paradox is ten miles from the Utah border about 1/2 way between Telluride and Moab). I’m wondering if you can tell me anything about a herd in Disappointment Valley, not far from the Naturita – Dove Creek area. I took my class for a visit, and observed them privately myself a few times, but I’ve since moved and haven’t been able to keep up. Last I knew they were going to explore the area with boom trucks fro gas and oil drilling. Any news would be appreciated. This is that herd. 🙂 Very cool that you took your class to see the horses! I wish I’d met you when you were teaching there. We haven’t been told anything about boom trucks – in the basin or in that general area? I do know the Pinon Ridge uranium mine was approved … by county commissioners, I think. The horses are doing very well! T.J. My name is BoB C and I’m from Ontario Canada . We have been studying Wild Horses and Burros on the open Range for some time now. I sent some Pictures and videos to Mara, in Durango. We will be looking for Wild Free Roaming horses in New Mexico and South west Colorado this spring. I would certainly like to discuss this with you. The wild horse is an icon of the American west. Many people respect the wild horse for its power, intelligence, will to live, and its stubbornness to be wiped out. The wild horse, or mustang, stands for the west; when people think of the west they see a wild, free, untamable horse. They see a mustang. What many people don’t know is that the land the horses are living on is tiny, dry, and scarce in food. The scant lands that the wild horses were given to live on are being taken away from them. Because the horses are being pushed off the land that was established for them to live on, the number of herds and the over all number of horses is diminishing rapidly. In addition to this too many horses are being crammed onto too little land. I ask that in order to save the American mustang we stop taking away the land they live on and give the land that was taken back to the horses, and also give more them more land. There is plenty of land in the United States, which is being used to graze cattle. The wild horses need to stop being pushed off their land. The land that was taken also needs to be given back. According to the American Wild Horse Preservation Campaign The Wild Free-Roaming Act of 1971 clearly states that horses are to be managed on thirty seven million acres of public land in three hundred and three herd areas. The average number of horses in a herd area ranges between seventy five to over one thousand. Already the BLM has pushed the horses off of one hundred and one of these herd areas consisting of nineteen million acres. Every herd area that was eliminated had horses on it. If you do the math, all those horses on every herd area, the number of horses gone from the wild is huge. The BLM is taking away land that was rightfully and lawfully established to let the horses live on. If the BLM doesn’t stop pushing the horses off the land, their numbers will continue to fall rapidly. The spirit of the American west will be gone and lost because the BLM took away land that the horses had a right to be on. Please don’t let this happen to them. The wild horses also need more land to live on. Many horses aren’t being adopted and are at risk of being slaughtered because of the Burns Amendment, which states added to the Free Roaming act. If the horses had more land these horses, at risk of slaughter could be free, living in the wild. The gene pool for the American wild horse is dangerously low. This is partly because the BLM goes off the estimate made by them that the population increases at about twenty percent each year, (the national academy of sciences estimates this rate to be close to ten percent each year) once the BLMs estimated population passes the limited number of horses the land can support the excess horses are rounded up and sold. If the horses had more land, the horses on this land could help ensure a stable gene pool. Each time the BLM rounds up the horses based off inaccurate estimated population the gene pools get smaller. Already six states have lost their entire population of mustangs. There is plenty of land that could be used to let wild horses live on, why can’t the BLM let them graze on it? BLM grazing lands for cattle take up an area of two hundred fourteen million acres and costs millions of dollars to maintain, yet the cattle grazed on them only make up three percent of our beef national beef supply. The land might be rough, but one of the virtues of the mustang is that it can survive almost anywhere. Two hundred fourteen million acres is far more than enough to feed three percent of the nations beef cattle, if the BLM set aside land for the wild horses there would still be enough land fore the cattle to live on. We should allow the icon of the American West to graze on at least fourteen million more acres. If we did this and took accurate counting’s of the horse populations each year the population would stop falling and the gene pool might grow back to a healthy size. There are a few specific groups of people who won’t agree with this. The first are the cattle ranchers they won’t agree because ranchers have had a grudge against wild horses for a long time. They don’t like them because they it the grass their cattle could be eating. If the BLM gave the horses more land it would cause the ranchers to be mad. Maybe we can compromise, something like a ratio of 5 horses to every cow on a wild horse reserve. The second group of people who might not like the idea of giving horses more land is the adopters. They might not like it because people adopt horses with the best confirmation and color, but with more land more horses would stay wild. This means that the horses with the best confirmation and color would stay wild. Most adopters love wild horses and want them to be wild; I don’t think that they would mind seeing them stay wild. The third and final group of people who might not want to give the wild horses more land is the BLM, they might not like this because it would mean that they would have to move some wild horses to new land that might cost a lot of money. Although according to the AWHPC the BLM uses ninety-five of the money fore wild horses on moving, capturing, and facilitating the horses out of the wild, so I think they have enough money to do it. The wild horses are having the land set aside fore them taken away, already one hundred and one herd areas that represent over seventeen million acres. This land needs to stop being taken from them because there numbers are falling. Also wild horses need more land to live on, there are to many horses not being adopted and they could be wild if the wild horse populations of the United States had more land to live on. Another reason they need more land is that with there numbers falling, their gene pool is getting dangerously low, with more land to live on their numbers would begin to rise and their gene pool would gat larger as well. Finally there are millions of acres of public land not being used for anything but cattle grazing. The cattle being grazed on this land make up less than three percent of our national beef supply. We could give the horses some of this land and still allow a small amount of cattle to graze on the land. All I ask is that we give an icon of the American west the land that we took from it back; the land that was taken from them even though a law officially said that the land was for them to live on, and that we allow them to have more land so that their numbers can rise and their gene pool will go back to a safer number than what it is currently at. I ask that we allow them to live on a more acres of public land that are being used for nothing but graze cattle. Please don’t let the icon of the American west to disappear from the west. Hanna, You have indeed made many sensible comments about wild horses and BLM land. I have always had horses and I also have a small herd of cattle and a few sheep but all in all I agree with you.Let’s use some of the public land for wild horses and why not manage their numbers when needed. Being purist for cattle and only cattle does not make for an interesting life for any of us. Hey TJ! I just stopped in to say hello, and to thank you for taking such fabulous pictures of the horses! I am a photo enthusiast, (thanks, mom, for planting THAT seed in my brain) and I admire your photography. I also believe strongly that if we don’t at least slow down these roundups, we will have no more of our gorgeous history and heritage – the wild horses – to represent us. It would be tragic. This HAS to slow down, if not stop altogether. This, in my mind at least, is wrong. The roundups sometimes result in deaths, if not serious injury. How come the BLM don’t notice the tragedies that are a result of these operations? Are they so blinded by their work that they can no longer see? How is this possible? Tami, I think such a book is a great idea. Our chapter of the National Mustang Association has tried to promote this kind of education at adoptions of Spring Creek Basin mustangs much longer than I’ve even been involved. If I can help, I’d love to. I’ll send you an email. Tami, do you still have this wonderful creme colored horse? Yes Janet, and he is wonderful. Where in the world did you find this? WE JUST VISITED THE SPRING CREEK, CO. WILD HORSE AREA ON THE WEEKEND OF OCTOBER 15, 16,& 17, 2010. THE 1ST BAND WE SAW HAD 3 MARES AND A VERY LIGHT GREY STALLION, NOT TRAVELER. WE OBSERVED HIS BAND JUST AFTER THIS 1ST ONE. TRAVELER’S BAND HAD A FOAL ALSO, BUT COULDN’T GET A GOOD LOOK AT IT BECAUSE IT WAS LYING DOWN. ( I THINK BROWN W/ WHITE ON FACE). TWO OF THE MARES IN THE 1ST BAND HAD IDENTICAL BRANDS HIGH ON THE RIGHT HIP. THE BRAND WAS “F A”. ANY IDEAS ON THIS??? I HAVE VERY GOOD PHOTOS OF THE BAND AND THE BRAND. THE BRANDED MARES WERE COLORED AS FOLLOWS. : I. BLACK WITH A WHITE BLAZE, AND A SMALL PATCH OF WHITE ON THE BELLY. LOOKS PREGNANT, VERY FAT. THE 2ND MARE WAS A DUNN OR VERY LIGHT BROWN WITH A WHITE BLAZE. WITH THEM WAS A STRAWBERRY ROAN MARE VERY TINY, MAYBE A YEARLING AND THE GREY STALLION. WE VISIT THE SPRING CREEK HERD TWICE A YEAR, AND THIS IS THE FIRST TIME WE HAVE SEEN THESE HORSES. JUST WONDERING IF ANYONE KNOWS THAT THESE HORSES ARE IN THE AREA AND WHY THE BRANDS? THANKS FOR YOUR CONTINUED INVESTMENT IN OUR WILD AMERICAN HORSES. OH, P.S. WE SAW A BAND WITH A BLACK PAINT FOAL. THIS FOAL BARELY HAD ANY WHITE AND A BROWN PAINT FOAL AND ANOTHER BAND HAD A SORREL FOAL WITH A STAR ON THE FOREHEAD. SO EXCITING AND INSPIRING. ALL THE HORSES LOOKED GREAT. Hi, Sue – glad you had a great visit with the horses! Awesome that you get out there twice a year to see them! The first band you saw is Kreacher’s (grey stallion), with Raven (black-and-white pinto mare), her yearling filly Corona (who is basically very light palomino) and dun mare Kootenai. The “FA” brand designates them as being from the Sand Wash Basin herd rounded up in October 2008 and given PZP-22. The third mare that was introduced with them, Mona, is now with a different band and had a foal in mid-September. I was hoping Raven was, indeed, just in very good condition … I’ll keep an eye on her. The mares were introduced in late October 2008 to boost Spring Creek Basin’s herd’s genetics. Previously, three mares from Sand Wash were introduced in 2001, and three stallions were introduced several years before that. Traveler has a grey mare, Houdini, and their yearling filly, Terra, who is turning grey, and their 2010 filly, Gemma, who is already very grey. In the pinto band is a very dark bay pinto colt – Maiku (“my-kuh”) with minimal white – just a “slash” over his withers and high stockings, especially his left front, where it’s above his knee. He’s the son of the dark bay pinto mare with darker/more splotches, Kiowa. The solid bay yearling colt (Milagro), black-and-white 2-year-old filly (Spook) and dark-bay-and-white 3-year-old filly (Reya) also are her offspring. The red-bay-and-white pinto mare with a lot of white (Chipeta) is the dam of the bay-and-white pinto filly with lots of white, Puzzle. The bay stallion with left front and hind fetlock markings is Copper, the band stallion. The black-and-white stallion with a “heart” marking on his left side, Corazon, is a bachelor, as are Ty, the very dark grey stallion, and Mesa, the solid bay stallion. No sorrel foals this year, but the bays are very “red” and may have looked sorrel from a distance. A few of them have stars or white markings on their faces. I like what you said earlier about the BLM treating them like elk or deer, rather than cattle. It was my experience, and I’ve used those exact same words to compare, that my BLM filly, Beautiful, reacted more like an elk/deer when I first began working with her. It’s an important detail and I like to stress it whenever I tell people what I’ve learned. Also, I do believe that all Mustangs can be gentled, but not necessarily become rideable, safe mounts. When I adopted, I was in it for the long-haul–she had hooves that could have rendered her permanently lame without intervention–I didn’t have many expectations except to provide her a home and good care. I’ve been lucky though, because she’s done extremely well and will be just fine. I have to disagree with you on Appies- they are as different as members of other breeds. With Arab, QH and TB lines allowed as outcrosses, there are now Apps very like QHS in temperament. My own very best horse was an Appy half-Arab with a LOT of TB- she looked like a spotted Anglo-Arab and was rock-solid in every situation. Anyway! I was reading the blog to see if you listed a way to buy prints of some of your pictures- I was really interested in the red dun mare in the snow ones. You really need a better pic of yourself. I might run into you one day and not even notice who you are to say Hi. TJ Thank you for orienting us and sending us out yesterday! What a lovely day! We saw 4 horses. A black mare w/ foal, and maybe last year’s baby? hanging with her and a watchful gray/black w/ a white blaze, perhaps the stallion? They were quite wary of our horses and kept a distance. We must all remember that if these horses are NOT managed, whether we like the term “management” or style of mgmt, we will see them suffer greatly, as they would in the true wilderness. I am desperately saddened to see sick, starving horses in ANY situation. Any sort of compromise that reduces suffering I applaud, and we should continue to make improvements in techniques we use. TJ’s work is INVALUABLE to the care and management of these horses. THANK YOU! They look healthy and strong. I think your input in selecting the horses for adoption will be so important. Kelly, thank YOU and Tom so much for coming and riding! I hope you’ll return again and again. I agree – the horses must, indeed, be managed. The 1971 act calls for it, and the fenced, finite dimensions of their environments demand it. You guys saw David – who must have rolled in the mud to give that greyish hue? 🙂 He’s very dark mahogany bay (I think Mahogany is his dam; there will be pix up soon of her and her new filly). Shadow is the black mare (she’s 4 this year), Wind is their yearling colt, and Coal is their baby. This is one of the wariest bands in the basin – I’m so glad you all saw them! Thank you both again for coming – it meant the world to us! Hey T.J. It’s me. Hayden. Not the horse. The other Hayden. I found your blog! It’s pretty cool! I really enjoy the photography. I’d like to check this out with you sometime. I’m also a wordpresser: markhayden.wordpress.com. Feel free to check it out. I just wanted to let you know I did what I could to get my input in to my St. Senator about trying to find a better solution in saving the wild horses. I’m not an expert, but 2 cents probably won’t get to far. There are other people out there with valuable input on this situation. I even tried to send a email to Night Line to do a Human Interest Story on these horses. So, I’m trying to make a difference. Hope others will do the same. A lot of 2 cents adds up to a mound of dollars. 🙂 Thank you for making a difference! Deirdre – Did you get my email? I haven’t heard back from you, so I wanted to double-check your email address is correct as above. Hi! So glad you could make it out to Spring Creek Basin! Yep, there are quite a few roaming around … I wish we could keep them all … You saw Seven’s and Chrome’s bands. Seven is probably the one you thought might be Traveler – I’m pretty sure he’s his son! He’s the very light grey stallion with the very short/wispy mane and tail. He has the sorrel mare with the bay/brown foal and the dun mare and bay almost-yearling filly. Chrome is slightly darker grey with the very long mane … he has a slightly “browner” dun mare, sorrel colt, grey mare, dark yearling colt and darkish-going-grey foal. I hope you had great visits to all of Colorado’s wild herds! They’re awesome to see … I still haven’t lost my awe of them! Oh, Thank you so much for identifying the ones I saw for me! What a thrill it was! I am learning so much from yours and others’ blogs in your links. Billie identified the one horse I saw in Little Book Cliffs as Chief and reassured me he was ok where I saw him. Next time I come out, I hope to make a contact with one of you beforehand. I would love to live there and get involved someday. Thank you again for being an advocate and sharing the info and photos with us! It is appreciated! Hi, Madeline! I would love to figure out how we could get your girls involved with the horses! Would you consider having one of your meetings in Spring Creek Basin? I don’t know how it would work with school schedules … I’ll contact you by email. I am organizing a hearing with San Miguel County Commissioners about the round-up, after seeing James’s movie, Wild Horses and Renegades. I have lost your email and would love to be in touch. I was shocked at the numbers of horses they are taking, and the treatment once captured. What happened to the mare birth control method? Would love to bring the Girl Scouts out with Madeline. What is your stance on this? I don’t have time to read all comments on the blog right now. TJ – I’ve enjoyed reading your data today. Thank you for sharing this! The story of Grey (commonly known as Traveler) that was released back into the basin on Sept. 19, 2007 is of great interest to me at this moment. I would like to know if maybe you would be interested in helping a team of us help some other older wild horses get returned back to their homes? In the recent Butte Valley – Nevada wild horse roundups the last 3 stallions taken from Triple B (Butte Valley) are all 10-15 years old. BLM isn’t supposed to be taking horses that old. We would like to see them returned to their homes. If you have an email addy or phone number you can share with me, I would like to contact you. Maybe you might have some insight as to how we might go about getting those older horses returned. Thank you for all your work to help the wild horses. Thank you for your diligent work on behalf of all the horses! I have many questions – esp. @ how to establish a working relationship with BLM, for the sake of improving gather techniques in Nevada. ALSO: I’d like to know about the process to bring Grey/Traveler back home. BLM has taken some old stallions that should never have been removed from their peaceful “retirement” homes. I feel so fortunate that I found your amazing blog on fb through a mutual friend. I am so thankful for you passion for the Wild Horses and your documentation of their lives. What is the latest on the round up that was supposed to happen on 9/15/11? Blessings to all the beautiful horses, all of their lives are valuable! Thank you for everything you are doing….I am hoping others are doing what you are to help these horses live free if that is what they need to do. wow! your thorough educated not blindly biased work is a true gem! I have been looking and looking for info on the web and via interviews. would love to talk some time. thanks for your work- I am sure it has been both extremely fun and painful. I am about an hour north and west of denver. Your blog is wonderful. I stumbled upon it quite by accident and was so intrigued I read the entire blog an became a subscriber. Your photography is breathtaking and I can only imagine how wonderful it must be to visit the basin. Thank you for sharing the stories of the Spring Creek Basin Mustangs!. I work for an environmental engineering company and write a blog as well. My pieces are on a variety of subjects. I recently wrote a piece about you and would like to re-post a couple of your photos. My hope is to send more subscribers your way. I’d be happy to send you the piece to preview. TJ, I would really love to contact you more “personally”. I adopted a horse from the BLM in 2001–became titled in 2002–that had been gathered from the Sand Creek Herd. He is a dead-ringer for Copper, and I’d like to exchange a little information, pictures, etc. with you and try to learn more about that particular band. Love your wild mustang photos . Great portrait shots ! What camera and telephoto lens were you using to get them ? ……. Rich. Hi, Rich – and thanks! I shoot with a Canon DSLR – 50D or 40D – and a 100-400 mm lens. I crop almost all my photos. I spend a lot of time with the horses, too, always being quiet and respectful. That helps a lot! Hi, Barbara! Please let me know when you’re in the area; if possible, I’ll take you through the basin and introduce you to our mustangs. Aren’t Pati and Sherwood great! Great to hear back from you TJ – would LOVE to make my first visit to the basin with you if you have time. I’ll be in area early April to help with a rock art project at Sand Island, then in Cortez for a few days, specifically to look for short-term rental property, visit Spring Creek and, if possible, poke around the new Lone Mesa State Park, which I know is not officially open yet. Could you email me so I can let you know dates I’ll be around. Can’t wait to (hopefully) finally see some of the horses. After visiting you in April with Jess, I have been following your blog and often showing the pictures to my 9th graders – they love it! And we have all been excited to see the new babies – I try to show them your pictures of each new foal – it has become a bit of a class ritual this spring to read your blog before we start the history business of the day. Sue – how wonderfully awesome! I’m so glad you and your students are enjoying the horses so much! I am biased, of course, in thinking they are the most magnificent creatures in the world. 🙂 Thank you so much for your note; I was actually thinking of you and Jess this morning before I turned on the computer. His mom sent me a pic recently – of the family – from waaaaay back. Who ever would have known, then, that I’d be here, doing what I so love? Encourage your students to never give up on their dreams – even if it takes them a while to figure out what those dreams are! Great to hear from you, and hello to Jess! I’m also sending her your blog address. THANK YOU for the constant delight of meeting each new baby. As I’ve said before, I WILL get to meet you someday, and get out to the basin, hopefully many times in future. Wow, I just found you, what a wonderful gift to the beautiful wild ones. Im trying to understand the breeding on the foaling heat. Do the mares stop lactating if they breed? Or do they try to avoid breeding when they have a foal? I work with a rescue that rescues nurse mare foals. I will enjoy reading your stories, and thanks for your answers in advance. Becky. My mustangs are from Nevada,and Kansas. Will get back to you ASAP. Out of town right now. I would like to get in contact with you on the programs and the ways you work out at the HMA. I would appreciate a few moments of your time as I am trying to get Sand Wash Basin and Piceance/East Douglas established with my organization to benefit the wild horses and the range. to check out the horses, give me a call. Hi, Vern! So great to meet you and the others. Thanks so much for having Pat and me as speakers about one of our favorite subjects! The mustangs are best seen in person, so I hope you’ll consider coming to the 4CBCH count next month. Give Pat a shout. Hope to see you there! Hi TJ…my name is Julie. My husband and I moved to Farmington NM last week and found this web page tonight. I’m interested in making a visit to Spring Creek Basin. Could you tell me a little more about it and where it’s located. I had the pleasure of making several trips to Sand Wash Basin when we lived in Craig so would like to continue to visit new areas. I appreciate your help. Hi TJ! They are trying to decide what to do about the feral horses in Mesa Verde National Park. You probably knew about this but just in case you didn’t, here’s the info: http://parkplanning.nps.gov/projectHome.cfm?projectId=60864 Input is due by January 8, 2016. Thanks, MK! We do know about Mesa Verde NP’s latest “appeal” to the public for comments about what to do with the wild horses there. Given what we’ve heard, public sentiment is the same: Keep the horses. NMA/CO and American Wild Horse Preservation Campaign hope to work together on this issue. I was one of the SCC crew leaders on the fencing project this fall. Was hoping to get in contact with you and couldn’t find an email anywhere so figured this was the best way. I just wanted to thank you for all of the time you spent with us on the project and for offering to take us to see the horses. I’m sorry we could never make it work time wise. Hi TJ! A friend of Julie’s from Killeen/Austin , Ali Tracey, is moving to Durango. Her boyfriend will be doing bike sales. Brent and I are telling her about you and your work. Thank you for taking care of the herd. Came across your page while reading ‘Wild Horse Country’. You’re doing a great thing here. As a horse lover for longer than I can remember I am happy to see that the wild is still wild. Your pictures are beautiful. One day (sooner than later) I hope I can adopt 1 or 2 Mustangs. Until then I will just have to settle for day dreaming and looking at pictures. Thank you for doing what you do. Iris greatly appreciated by all horse lovers and little girls (my daughter included) everywhere who dream of having a horse to call her own one day. Thanks, Lisa. 🙂 It takes a lot of people doing a variety of things to keep our wild horses and burros wild – OR to give good homes to those who have been removed. Thank you so much for your – and your daughter’s – interest, and I do hope you get to adopt those mustangs one day! I am reading WILD HORSE COUNTRY and learned of your work. Good for you! Hope cougars will be allowed to play their part in controlling mustang numbers. Thank you, Helen. 🙂 It’s doubtful that mountain lion hunting will decline. Killing predators is more ingrained in western culture than hating wild horses. Still, having balanced ecosystems is a goal to shoot for. I’m an artist and for the past few years I’ve been painting wild horses. I paint boldly and impressionistically, with freedom—just like wild horses. They are a natural for me. As my paintings sell through galleries, I would love to contribute monetarily to the horses and I may look into donating a painting. Please leave the horses alone where they belong. We cannot take them away from their God’s gift of lands and water just as the white people removed the Aneeican Indians from their lands and pushed them further away from white people. It was so plain wrong to take away their freedoms. So just leave the wild horses alone as they roo have their freedoms. They are capable to take care of themselves. Go find something else better to do and just leave them in peace. Shalom to all. My apologies for misspelling as I used the hand phone. It was typo. We work very hard to ensure that we are protecting and managing these horses and the range upon which they depend to the best of our ability. Thanks TJ. May God bless you to protect the horses.